Almost 40 schools applied to win €10,000 worth of solar panels for their roof. 20,000 members of the public voted and the final decision was made by a panel of esteemed judges. 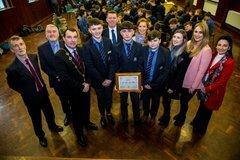 Some of the amazing projects being carried out by winning schools will include; making solar panels in science class; holding an environmental awareness week in school; hosting a ‘Run on Sun’ colour run; encouraging more students to cycle to school by building bicycle racks from recycled tyres and installing a solar powered bench outside the school that can be used to charge phones and laptops. Winning schools will be able to use free power all day generated directly from their roof, this will really reduce their carbon emissions, and during the weekends and holidays they will be able to sell any power they do not use to our partner 'Community Renewable Energy Supply' (Cres). It's really a win win win for the schools and the climate. Sadly, not all schools have this opportunity in Ireland. In fact, selling solar power is not an option for most, as there is no requirement for electricity companies to buy solar power generated at small scales. We don’t think that's fair. If you agree, and think all schools should have this opportunity, sign our petition here, to ask the Government to introduce a fair payment for solar power. We would like to thank all who applied for the 2018/2019 Solar Schools competition. We were beyond impressed by the standard of the project ideas this year. Based on the level of interest in the competitions pilot year, Friends of the Earth expect a dramatic increase in applications for the second round of the Solar Schools competition in late 2019. Closing dates for next year’s competition to be announced in the coming months. Keep an eye on our website for more information. Although the Sick of Plastic Campaign is being coordinated by Friends of the Earth and VOICE Ireland, it has very much been driven by people like you and the growing number of anti-plastic and zero waste groups forming around the country. It’s so great to feel as though we are playing key part in a strong movement for change. 2018 was certainly the year for plastic awareness, and we believe 2019 is the year for action! With so many dedicated people on board, we have no doubt it can happen. This year we’re increasing the pressure on Supermarkets, it’s time they took our demands seriously. 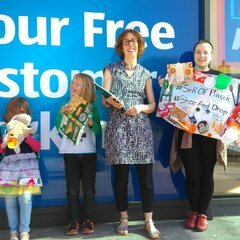 The Sick of Plastic petition now has over 16,000 names, and we want to present it to every major Supermarket in as many towns across the country as we can. 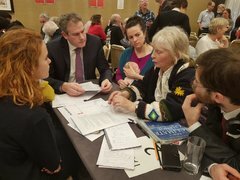 Meaghan, our Head of Mobilisation, is busy as ever supporting grassroots activists and communities through workshops and trainings all across the country, helping strengthen the growing climate movement in Ireland. Meaghan will be running environmental sustainability sessions as part of SUAS’ STAND Global Issues course for third level students in UCD, DCU and TCD in February. This week, we are also taking part in the WorldWise Global Schools National Teacher Training, educating our educators on climate change. In February, we will be supporting a group of young activists to organise two full days of connecting climate action groups. This will take place in Dublin city centre - more info on this coming next week. If you’re not yet involved in one of the groups - what are you waiting for? Friends of the Earth are the lead applicant in a project funded by The Wheel, ‘The Climate Campaigners Building Programme’. 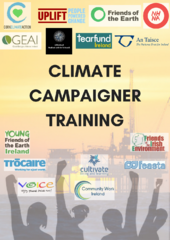 The project’s organsing team is comprised of a small number of members from 15 environmental and climate-related organisations including Uplift, Cork Climate Action, An Taisce, Not Here Not Anywhere, the All Ireland Student Activist Network and others are in the process of organising a mostly-online upskilling course for people engaged in climate activism, whose values align with those of the network and who require a community to build their capacity to continue in this struggle. A new European-wide Citizens for Financial Justice project has just begun. Our project ‘Finance: Fuelling Climate Change?’ aims to mobilise people to take action on the financial system for a more just world and a safe climate. This project is kicking off with some research exploring the EU level support that the proposed Shannon Liquefied Natural Gas terminal has been receiving. Once this research is complete, we will be running events around the publication and urging all of you to take action to stop this new fossil fuel infrastructure being built. The MidCat pipeline has just been cancelled - we have full faith that with enough people using their strengths in this movement at home, we can win this fight together too. Thanks to funding from Erasmus+ we are now part of the pan-European 'Growing Together' project, which provides a voice for young people, particularly those from rural areas, to engage with crucial debates on the future of food production, and the wider debates on the future of Europe. 'Growing Together' is led by five Friends of the Earth groups including Ireland, Malta, Denmark, Estonia and Cyprus. There are over 150 activities planned between now and 2020 across all five countries which will empower at least 3,000 young people from rural communities into active political debate on the future of our food system and Europe more generally. High Court is due to begin its judicial review of a decision to grant planning permission to the proposed €500 million Shannon LNG gas terminal due to be built in Ballylongford, Co.Kerry. No placards or banners - please respect court etiquette. Friends of the Earth are the secretariat of the Stop Climate Chaos coalition. Late last year, we coordinated the biggest lobby day (or TD-constituent speed-dating day! ), we’ve ever run - with 91 TDs, 5 senators and over 250 constituents taking part in ‘Rise for Climate, Jobs & Justice’. What’s more, over 1500 people emailed their TD in advance to ask for a meeting, over 1100 emails were sent by people who couldn’t make it on the day, and almost 300 students who couldn’t join as they were studying hard for exams signed a petition demanding action on climate. Watch the video of the day here. Eager to know if your TD(s) showed up?Click here to see if your TD(s) attended and if they signed the letter. Their email address, Twitter handle, and phone number are listed in this file, so if you have just 1 minute you can hassle them to sign the letter (which you can read here) in whatever format suits you. Red - did neither, boo! We're recruiting an Office Manager! Friends of the Earth is growing, and we're recruiting an Office Manager to help keep the show on the road. Do you care about the environment but care even more that the project budget balances and the Board minutes get out on time? Can you keep your head when all aroun d you are losing theirs (well, your boss is at least!). Then we need you :-). Friends of the Earth is a small, nimble organization, trying to change the world on a shoestring. We need committed, energetic people on our team. We work collaboratively to advance the organization’s goals, values and mission. And we look out for each other as best we can. As Office Manager your key responsibilities will include our day-to-financial administration; coordinating the administration of our institutional grants; supporting our governance activities, including Board meetings; and acting as Executive Assistant to the Director. The role is part-time (2.5 to 3 days a week, hours negotiable) - find out more here. Apply with with a CV and cover letter to info@foe.ie by 11.59pm on Wednesday 6 February. Thanks from all of us for your continued support and engagement. We couldn't do the work we do without you.